﻿There is only one thing that us commonly enjoyed by children as well as adults, It's the circus. The performers are not only human beings but animals too. The funniest of all are the somersaulting, jumping and dancing clowns. They entertain everyone. They show the tricks and make everyone laugh. Watching a circus is full of excitement and entertainment. The students of Playgroup enjoyed the same as they celebrated "Clown Day". Wittians paid tribute to Sardar Vallabh Bhai Patel on the occasion of his birth anniversary. Students of Grade- 8 presented glimpses of his biography through Power Point Presentation. The whole atmosphere was filled with patriotism when students presented a Mutiny against British Empire followed by a contemporary dance performance on the song Vande Mataram. Our traditional education system hammers out the individual voices of children and kills their natural creativity turning them into servile, course material slaves. Our children are not encouraged to raise questions in class, particularly when they disagree with the teacher. Children are not allowed to debate the topic taught. Subjects do not teach reasoning, imagination, creativity and innovation. Children are merely asked to learn concepts and subjects by rote. Because of this, most of the children never develop their own view point or the faculty to think. These children when mature into adults lack power to raise their voices against something that is wrong or they disagree with. They get conditioned to accept whatever is offered to them. This is the major reason why majority of us do not raise voices against abuses, corrupt systems and politicians. Our children should be motivated by all means to think creatively, debate, have opinions and should be allowed to speak up. They have to be taught that what is wrong is wrong, no matter who is behind the same. Schools, teachers and parents must train children from an early age the ways and means to protest, argue and fight against all that is wrong or improper. Children need to be made aware of their rights, duties and responsibilities right from an early age. Dream of a better India cannot be accomplished unless parents, teachers and society leaders resolve to develop thinking and problem solving abilities in children. The society needs to be supportive to people who take up social issues. Families need to be supportive to girls who get abused and exploited. Our Prime Minister, Mr. Manmohan Singh is being criticized severely for his inability to curb corruption and today he finds his government in the midst of CWG scam, 2G Scam, Coal scam, Aadarsh Housing Scam and many others. His government has acted stern against all anti corruption movements and has been successful in avoiding the demand for a Lokpal Bill. His government has also failed miserably in prosecuting the corrupt. Our PM, regardless of the scams that happened right under his nose still remains in power using all possible excuses like “I did not know anything about it”, “I have not benefitted from the same”, “It was Mr. Ahmed Patel who gave directions for allotment of Coal blocks” etc… The question here arises why is the most powerful person of India.. our PM so helpless. He is known to be a reformist, a true honest gentleman. Then why is he so helpless?…. The reason is that he is not allowed to speak up. Over the years, he has conditioned himself to obey… obey his masters. He has become more of a circus lion who despite having all the powers is conditioned and trained only to obey the ring master. Because of the diarchal power system existing with his government, he is unable to take action against the culprits. He is unable to set an example before the world that what is wrong is wrong, no matter who is behind the same. Or accept what you have lost. Clown Day was celebrated on Thursday,25th October 2012 by Playgroup section. Children entered the school with a smile on their face and were dressed up in very colourful clown costume and make up. Children were also wearing a clown's cap and clown face mask. Circus slides were shown to them on the computer. 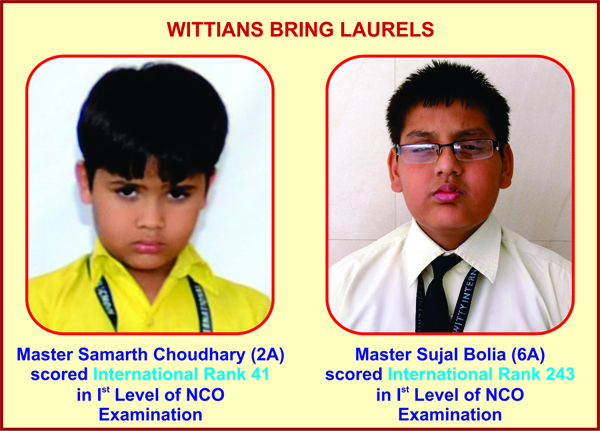 Wittians Samarth Choudhary of 2A and Sujal Bolia of 6A have made us all proud with their sincere determination and serious efforts by achieving International Rank 41 and 243 respectively in 1st level of NCO Examination. With the same zeal and spirit, may you succeed in the 2nd level. WIS family wishes you all the best in all your future endeavors. 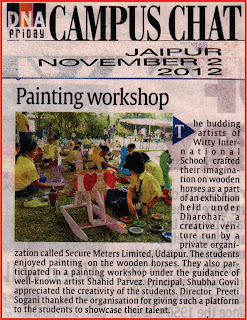 The budding artists of Witty crafted their imagination on wooden horses in an exhibition held under ‘DHAROHAR’ a creative venture run by a renowned private organization Secure Meters Limited, Udaipur. The land is known for bravery of the great warrior Maharana Pratap and the glory of his horse. The horse is a great symbol for the land of Mewar. Keeping the historic values in mind and giving a platform to paint their fantasies, Wittians participated in a Painting Workshop under the guidance of well-known artist Shri Shahid Parvez. The Witty pupils very enthusiastically participated in the workshop. Principal, Mrs Shubha Govil appreciated the creativity of the students and Director, Mrs Preeti Sogani thanked the ‘DHAROHAR’ venture to give this platform to Wittians to showcase their talent. 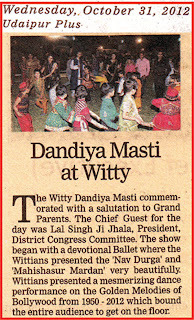 With festivity in the air, Witty too drenched itself in the mood to rock the floor on the occasion of Witty Dandiya Masti. 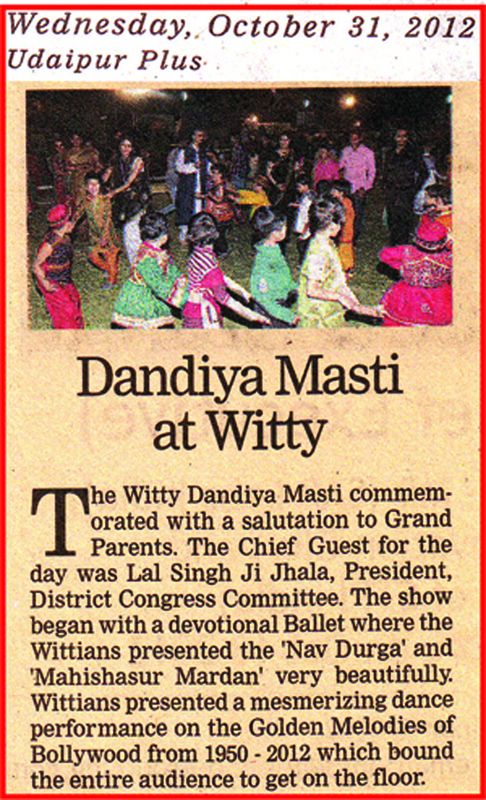 The event commemorated with a salutation to the honorable Grand Parents. The Chief Guest for the day was Shri Lal Singh ji Jhala, President, District Congress Committee. The show began with a devotional Ballet where the Wittians presented the 'Nav Durga’ and ‘Mahishasur Mardan’ very beautifully. Wittians presented a mesmerizing dance performance on the Golden Melodies of Bollywood from 1950 – 2012 which bounded all the youth and old to rock the floor. The highlights for the day were the competitions of Pooja Thali Decoration and Fancy Dress for the grandparents and grand child. 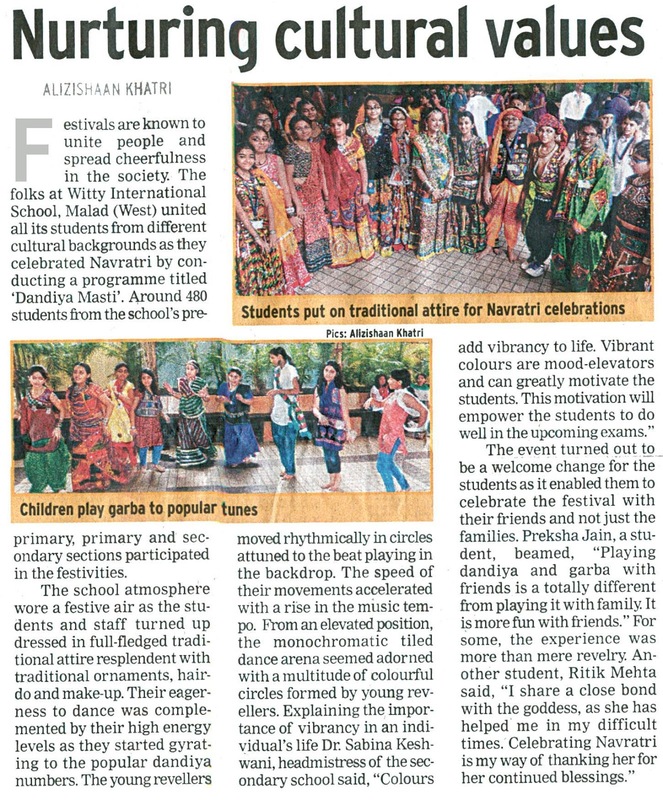 All the august gathering enjoyed matching their steps to the beats and rhythm of the traditional Garba and Dandiya songs. Everybody enjoyed the mouthwatering dishes at the food court. The show ended with the distribution of prizes to the winners of the competitions and the Lucky draw. The Directors, Mr Deependra Sogani, Mrs. Preeti Sogani and Mr Hemant Paliwal appreciated the performances of the young Wittians. 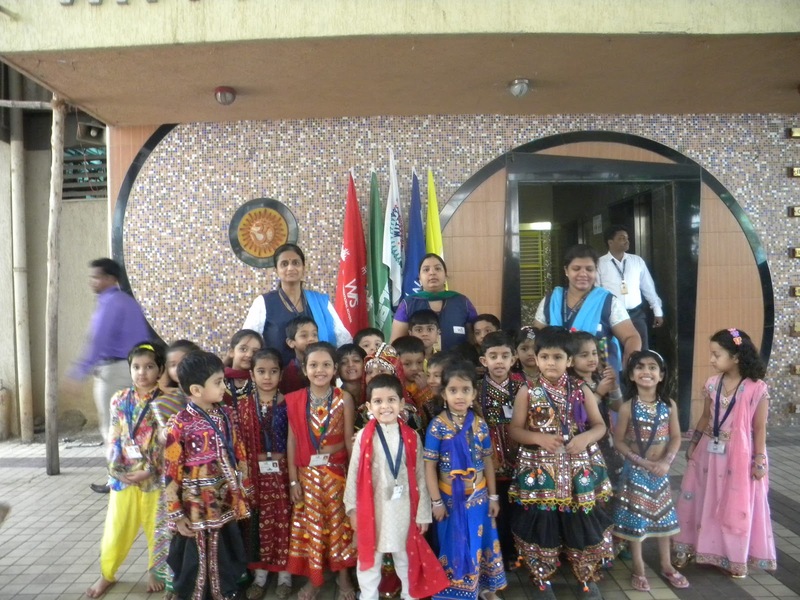 Principal, Mrs.Shubha Govil thanked everybody for their participation and support. 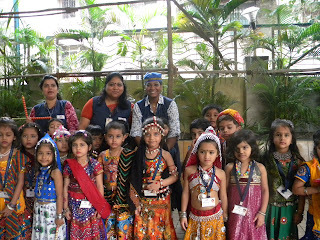 A field trip to Kora Gram Udyog Kendra, Borivali was organised on 18thOctober, 2012 for Grade - II students. The place is one of the oldest flag making units in India. It is known for making the tricolour every year on Independence Day and Republic Day.The students were shown the agarbatti and honey packaging units.The Kendra also has an exhibition centre on Gandhiji’s life called the Gandhi Darshan, which has over 200 photographs. Founded in 1942, Kora Gram Udyog Kendra continues to keep the ideology of Mahatma Gandhi alive.The students were highly enriched after viewing the pictorial journey of Gandhiji.They then visited the plant nursery which provided know-how about the different types of herbs and shrubs. Students were explained the importance of the same.The trip was an attempt to enhance students’ patriotic feeling and understanding of scientific temper. 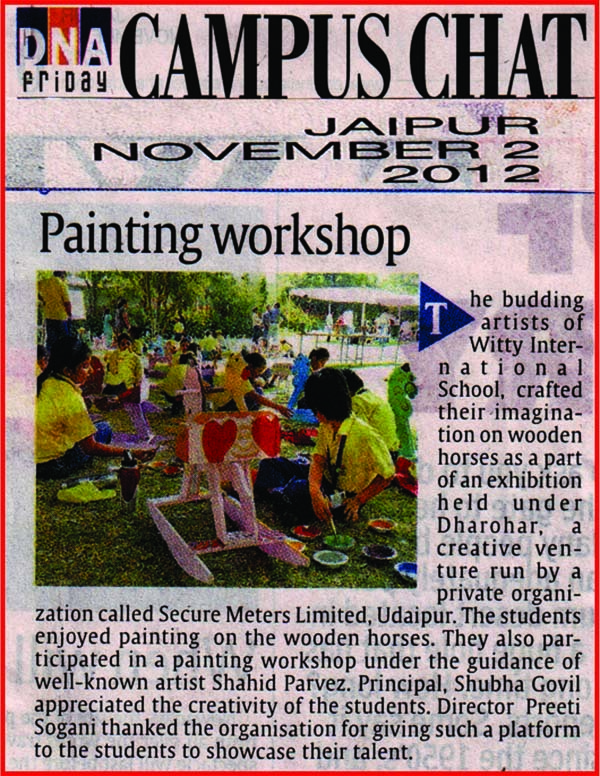 It provided the students with a wonderful learning opportunity and was immensely enjoyed by them. Festivals are the most important part of our lives. They not only break the monotony of life but also keep the moral values in place. Each festival conveys a message of Love and Peace in the society. Celebrations are the occasions where the cultural diversity of India stands in unison against all odds. The barriers of the age, cast, religion, gender do not exist at all. 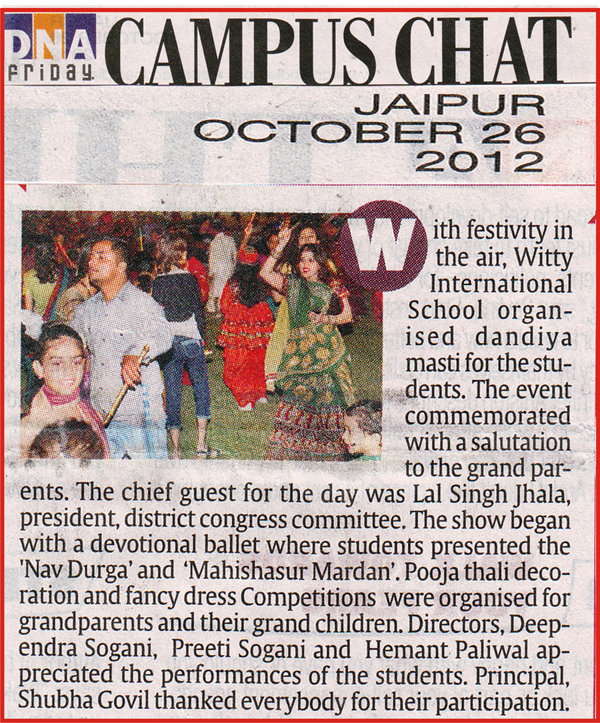 "Witty Dandiya Masti" was an occasion when the rainbow chose to adorn the earth. 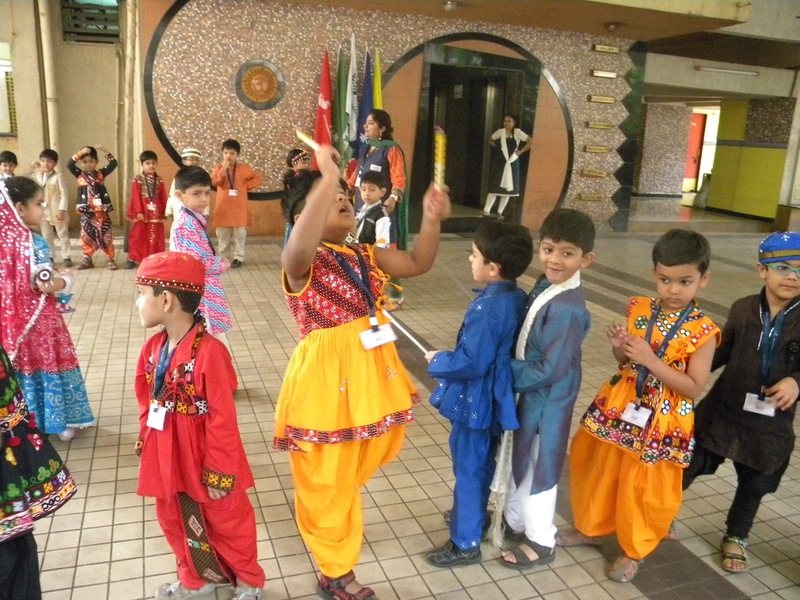 The riot of colours moved rhythmically involving all the generations especially the Grand Parents. The spectrum of rich cultural heritage for which India is well known all over the world reflected in the form of fun filled energy. The happiness knew no bounds for Mrs. & Mr. Chand Mal Ji Jagiteya Grand Parents of Ba. Nehal Jagetia when they were felicitated with the "Best Dressed Grand Parents" award. Ba. Anshika Babel of Grade III was on cloud nine with her family as it was awarded the "Best Dressed Family". Mr. Dilip Kabra became the centurian as the chair he occupied turned out to be the royal chair bearing No. 100 for which he was given the "Lucky Chair Award". Young and not so young (Old) enjoyed the evening together. The day was called off but the nostalgia prevailed. 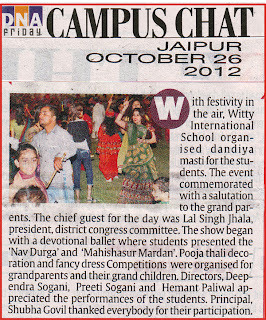 The parents commented that "Witty Dandiya Masti" was the biggest fun filled event of Bhilwara. Dusshera is a festival of good over evil. The children of Sr.KG came dressed in traditional clothes to school.Teacher narrated a story on why "Dusshera" is celebrated and showed slides regarding the same. 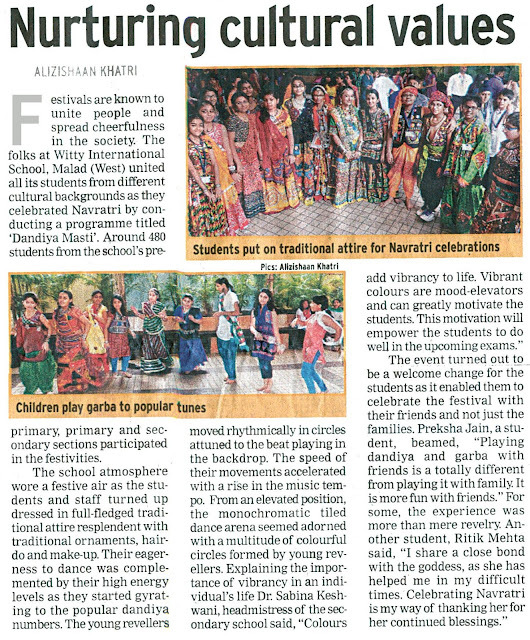 Children were then taken to the ground where they did Garba and Dandiya Raas in a traditional way.Children had fun and enjoyed the day. 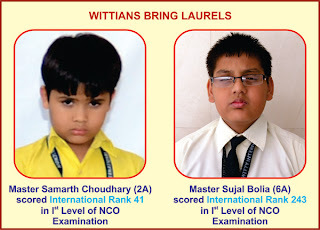 Inter-class quiz competition was held for Grade I - IV from Monday, 8th October to Thursday, 11th October, 2012 in the school library. Each team comprised of 3 members representing their class. There were 4 rounds, where skilfully formulated questions were asked to grill the participants. The students participated with complete gusto. Team which scored highest points was declared winner followed by 1st runner- up and 2nd runner- up. All the team members were awarded participation certificates. The winners were awarded certificates of merit. Students from the audience bagged certificates for their active participation.